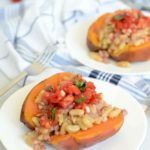 A healthy, Italian-inspired stuffed sweet potato recipe with a fragrant white bean and pancetta mixture and zesty bruschetta topping. First, bake the sweet potatoes. Preheat the oven to 400 degrees Fahrenheit. Pierce each potato about four times with a fork and wrap individually in aluminum foil. Bake in 400 degree oven for 45 minutes to one hour, or until the potatoes feel soft to the touch. Remove from oven and set aside. Add pancetta to a large sauté pan over medium-high heat on your stove. Cook until pancetta just starts to turn crispy. Add white beans, the two smashed garlic cloves, and the fresh rosemary. Cook until mixture is heated through. Remove from heat and set aside. Finally, make the bruschetta. Combine the two minced garlic cloves, tomatoes, basil, olive oil, salt and pepper in a small bowl. Now it’s time to assemble. Slice each sweet potato in half and smash down slightly to make a good “cradle” for the toppings. Top generously with white bean and pancetta mixture and then finish off with bruschetta. Serve immediately. Wine Pairing Note: This light dinner would pair well with a number of wines because of the multitude of flavors. A creamy Chardonnay, an herbal Sauvignon Blanc, or a light Pinot Noir would all be fantastic options with this meal.